Up until recently I did not realise how many products contained gluten. For anyone that suffers with coeliac disease it must be a nightmare! Thankfully I do not have it and neither do any family members. But the hubby and I have reduced down our gluten intake as a lifestyle choice. Personally I feel better for reducing gluten, I have a lot less bloating and feel generally better without it. One product that contains gluten, that I am sure the majority of household have, are condiments. We always have bottles of ketchup and brown sauce in our house. The amount of gluten free products that are available is growing, however I have never seen gluten free condiments. 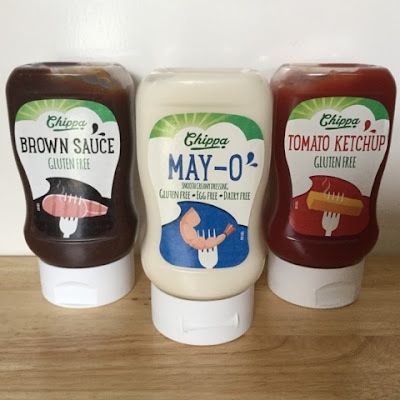 I was recently asked if I would like to try the UK's first gluten free condiments from Chippa. Naturally I said yes and I could not wait to try them. I received three of the most popular condiments in the UK, tomato ketchup, mayonnaise and brown sauce. In our family the children love tomato ketchup, while the brown sauce is for the hubby while I use mayonnaise on my salads. Therefore I knew that we would be able to give these sauces a thorough tasting! I will admit to thinking that we would taste the difference, especially with the tomato ketchup. In the past I have bought different ketchup's from cheap value ketchup to a more expensive organic ketchup and they have tasted different and the children have commented on the change from the regular ketchup that we buy. However we could not tell the difference with the taste of Chippa's gluten free ketchup! It tastes as good as a regular ketchup! Again with the brown sauce there was no compromise on the spicy, fruity flavour of the regular brown sauce. The Chippa's sauce had all of the same flavours. You really could not tell that it was a gluten free version. When it came to the mayonnaise I was really curious to taste it. As you know regular mayonnaise is made with egg yolks and contains cream. However Chippa's mayonnaise is not just gluten free but also dairy and egg free which makes it a great, all round free from sauce. When it came to the taste test, yes I could taste the difference. However it did taste nice and it is a mayonnaise that I would eat. Did I find it as nice as regular mayonnaise? No I'm afraid I did not but I do think that it great that there is, at long last, an alternative for people with an intolerance or coeliac disease. At the moment Chippa condiments are available to purchase at Sainsbury's and are priced at £1.59 which is a great price for a free from product! You can find all the information here. Disclosure: I was sent the selection of Chippa's condiments for the purpose of this post. No cash payment was received. All views and opinions are my own and 100% honest.